Join us for a special film screening of Talent Has Hunger at Cinecenta! Cellist Paul Katz will be give an introduction and be available for a Q&A following the film. 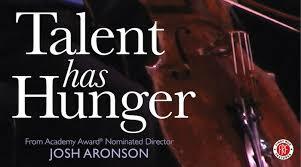 Talent Has Hunger is a film about the unique power of music to enhance the lives of people, from childhood through the last days of life. Filmed over 7 years, the film focuses on the challenges of teaching gifted young people and the intricacies of playing the cello through the words and actions of master cello teacher, Paul Katz. The message in the very marrow of the film is what a powerful enhancement to life music can be. Paul Katz is the legendary cellist of the Cleveland String Quartet, Professor of Cello at the New England Conservatory of Music and the creator of the inspiring CelloBello website.